A couple weeks ago, I’d arranged to meet with my friend Mr W who was in town for the weekend. Unexpectedly, his old grad school chums Messrs X, Y, and Z (can you tell that they loved the idea of having codenames on this blog?) tagged along but our chosen restaurant, Charlotte’s Bistro in Chiswick, managed to find space for all of us due to a cancellation that Friday night. Actually, I’d like to say up front that service was brilliant the whole night, with everything helping with great food and wine recommendations, and I’m not just saying that because we held our wedding dinner at their sister restaurant two years ago. After a couple rounds of drinks at the bar, we were led to our table. I like the spacing of the tables at the restaurant though our booth was a little tight. We were immediately distracted by the menu though; everything sounded good and it took us all a while to decide what to eat. 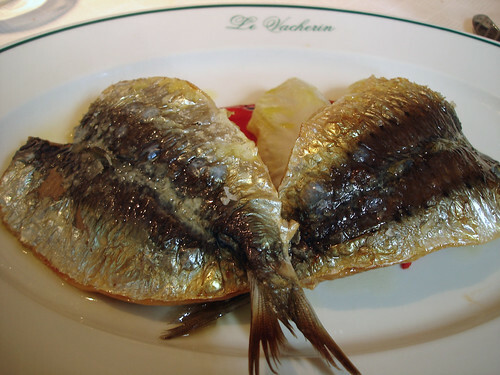 Many at our table started with the Cornish Mackerel “Polonaise”, Pipérade, Red Pepper Essence (£7.00) on the recommendation (and enthusiasm!) of our Polish waitress. I tried a bite from my friend’s plate and yup, it was a delicious bit of fish and was surprisingly not very fishy for a fillet of mackerel. 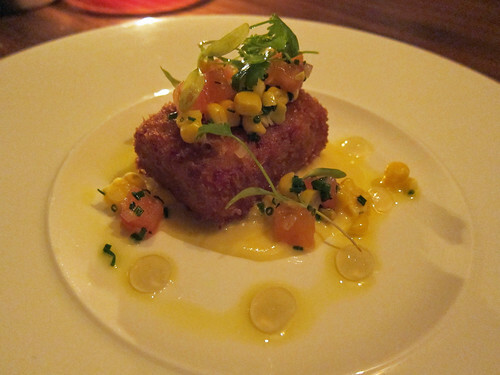 I had eyes only for the Kromeski of Middle White Pork, Sweetcorn, Curry, Coriander, Lime (£6.50), a delicious croquette of various porky bits served with the aforementioned accompaniments. The curry flavour came through in the sauce and went very well with the sweetcorn. 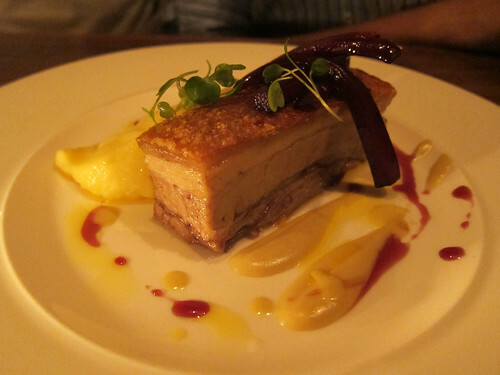 Moving on to mains, Messrs W and Z had the Slow Cooked Pork Belly, Pomme Purée, Port Wine Salsify, Oyster Vinaigrette (£14.50). It was an excellent piece of pork with equally fantastic crackling as my little bite assured me. 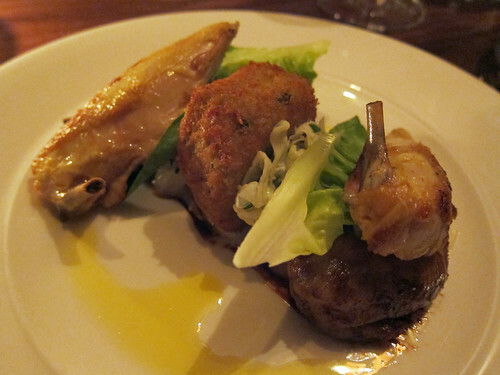 I went with the Beer Barbecue Baby Chicken, Falafel, Fennel Rémoulade, Ranch Dressing, Lettuce (£16.50). Normally I wouldn’t even look at the chicken option on the menu but something about its description on the menu grabbed me! I had half a tender baby chicken on my plate and along with the tasty and sizable falafel, I got quite full and was passing bits of food to Mr Y who had chosen a lighter fish meal. While it was, yes, well cooked, it was still the least exciting dish on the table: that’ll teach me to order the chicken! 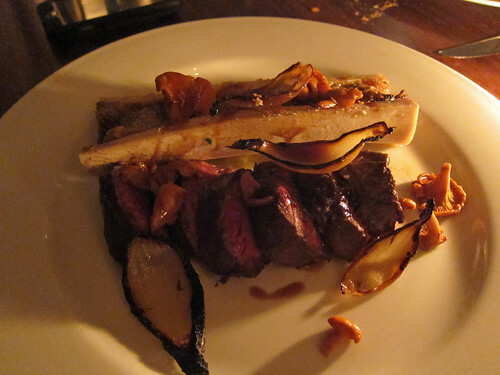 Check out Mr X’s Macken’s Scotch Beef Onglet, Smoked Bone Marrow, Charred Onions, Pickled Girolles (£16.00). I love the look of that bone marrow. Somehow we all ended up with different desserts. 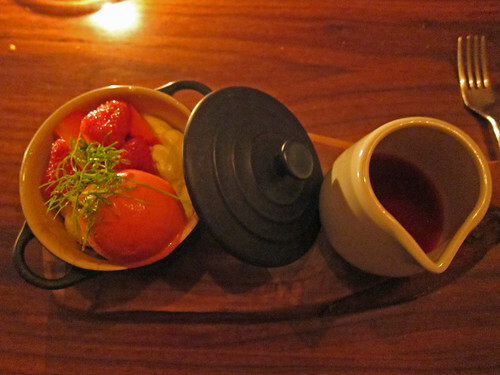 My Vanilla Cheesecake, Strawberries, Fennel Flowers, Honey Syrup (£6.00) was presented in a little Staub pot and was indeed delicious, all creamy and fruity with a hint of anise. 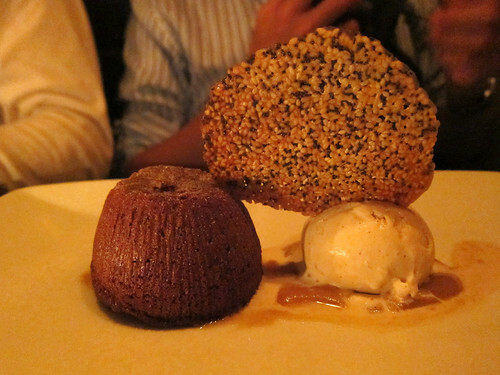 Mr W’s Chocolate Fondant, Salt Caramel, Tonka Bean Ice Cream, Sesame Cracker (£6.50) was excellent and came out much faster than the expected 20 minutes as stated on the menu. He was very happy with it. 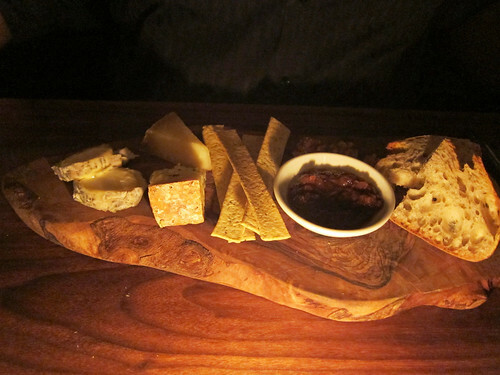 Mr X wanted something a bit more savoury and went with the cheese plate: Cheeses (3), Grape Chutney, Nuts, Lavosh Crackers (£8.50). I didn’t partake of the cheese but did nibble on a deliciously crisp cracker. It was a grand night with everyone at our table leaving with very good impressions of the restaurant. 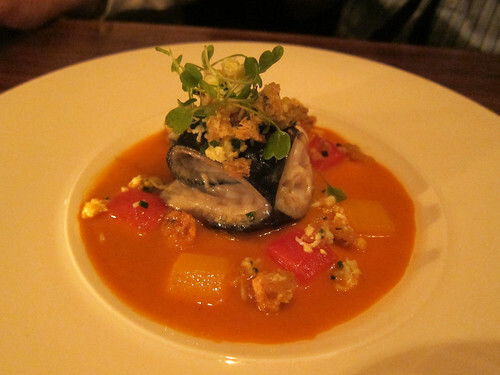 While the cuisine here is not the kind you search for to be challenged, it was all very good and made us very happy indeed that Friday night; I’ll definitely be returning as it’s so convenient for us in West London. As I mentioned before, service was fantastic and it really made for a great night. And Mr W, your mates are fun! There’s still one more day to enter to win either a weekend away in Wales or a hamper full of Welsh goodies! Please see this post for details. There wasn’t much information online but I did manage to find someone’s comments about a similar event in the past and I learned that one could either eat there or takeaway. I chose the latter option and swung by to pick up two dinners (£5 each) and they even came with dessert! If you chose to eat there, a number of communal tables had been set up inside the hall with the dinner served buffet style. It all looked good and I hurried home with my bag of goodies, just as many of Chiswick’s residents also did. 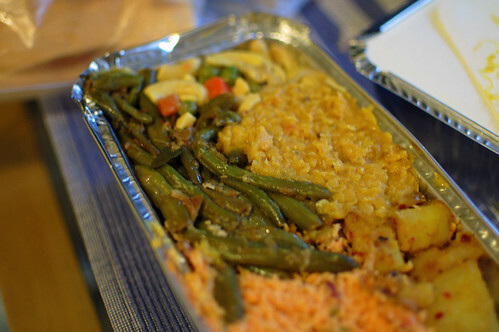 At home, I opened the tin foil containers and uncovered a treasure trove of what I imagine must be home-style Sri Lankan treats. 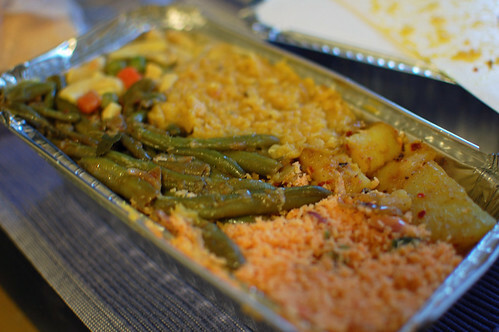 I’ve not had much Sri Lankan cuisine and what I’ve had were in restaurants and totally different from what I found here. 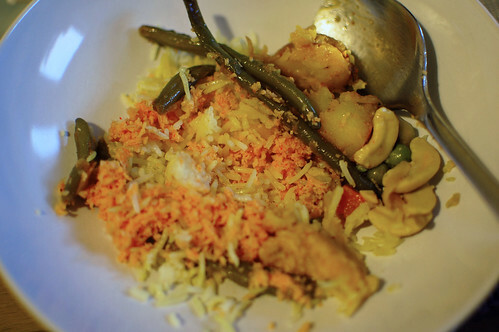 On a bed of basmati rice were tender green beans, stewed cashew nuts with mixed vegetables, spiced potatoes, a delicious dal made from red lentils, and a hotter-than-it-looks coconut sambol. There were even freshly fried poppadums in little baggies on the side. 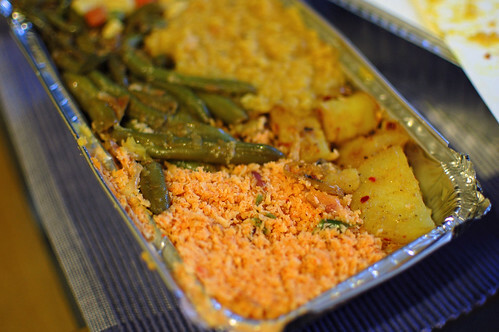 We adored the new flavours to us; everything was spiced quite gently (except for the chilli hot sambol) and was indeed very different to the northern Indian food we come across more frequently here. 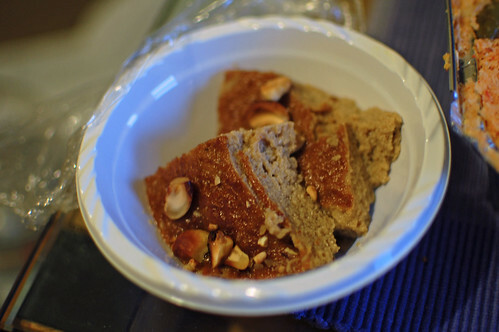 The cashews had been stewed to softness, a texture I can’t say I normally associate with the nuts, but they were still excellent. I doubt I’d be able to reproduce any of it but it was all delicious and I really should explore Sri Lankan cuisine more. Dessert was an utter delight; I believe it was called wattalapan. The lady dishing it out called it a custard and a steamed custard it certainly was, but one made with coconut milk, eggs and jaggery and topped with cashew nuts. Creamy and sweet, it was the perfect end to our takeaway dinner. I have no idea when the next fundraiser is but I imagine it’ll be on their online newsletter. 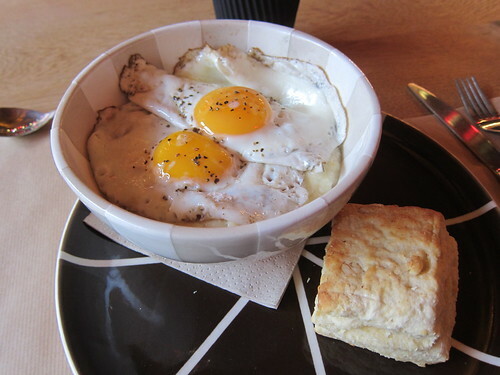 I found it a fantastic way to learn more about a new cuisine; are there any similar places or events near you that serve home-style food like this? There are a surprising number of Persian restaurants and shops in Olympia, Hammersmith and Chiswick. I’m not sure why there are so many here – does any one know? 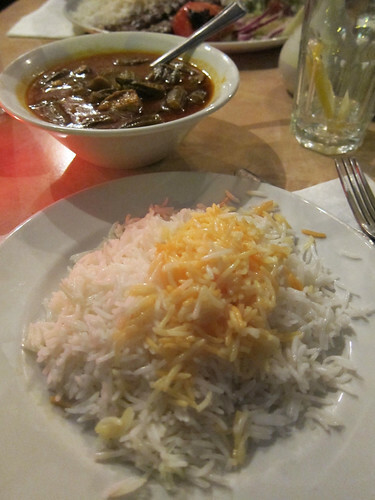 I’m not one to complain, of course; I adore Persian food and love that it’s all here on my (West London) doorstep. I was a-hankering for some and so last Saturday, Blai and I went out for a date night and while we were turned away from our first choice as it was packed, we managed to find one free table at another equally packed Persian restaurant just across the street from the first. This restaurant was Faanoos; their first restaurant is in Richmond and this Chiswick branch is their second. We started with their Mixed Mezeh for 2 (£7.95) and it was a good introduction to what I suppose must be their most popular dips. Salad Olivieh (chopped potatoes, eggs, chicken and pickled cucumber mixed with mayonnaise and lemon juice) – this is essentially a Russian salad all mushed up and surprisingly, it tasted fantastic! Next time, we’ll likely just order one or two of our favourites rather than go all out with the platter again. To go with all this, we had a round of Persian bread (£1), freshly baked in the oven next to us. 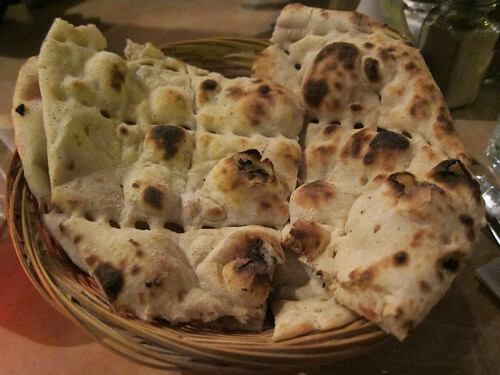 That man was churning out flatbread after flatbread; the demand was pretty relentless. The small restaurant gets through quite a bit of bread. We split two main courses. 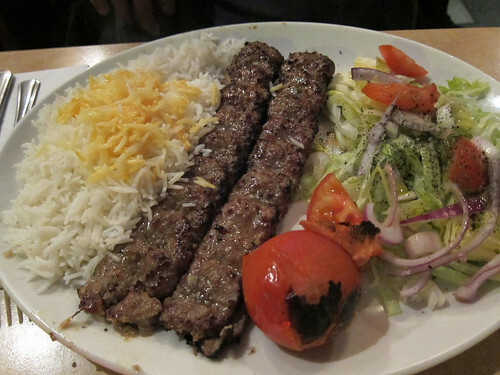 First, a grill, of which there are quite a few on the menu: Chelo Kabab Koobideh (£6.50), which was two skewers of a most tender and juicy minced lamb with a side of saffron rice, grilled tomatoes and salad. The only quibble was that I prefer my tomatoes to be much more grilled, allowing for you to squish the hot juices into your rice. Also, we weren’t brought any butter (lovely melted into your rice too) – they forgot. If they forget to bring you butter, remember to ask for it! 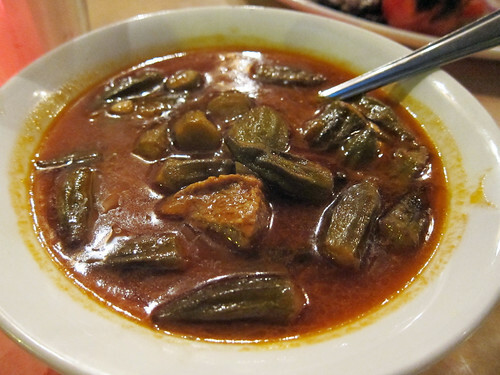 Second, an Okra stew (£6.95) full of lots of soft baby okra and lamb that fell apart at a touch of the fork, all in a thin tomato and garlic sauce. Rice on the side, of course. The flavours were gentle but extremely soothing and those flavours certainly popped more when the stew had cooled a bit from its piping hotness when it was brought to us. With a bottle of sparkling water and a glass of doogh, a salty yogurt drink, date night cost us a total of £28. 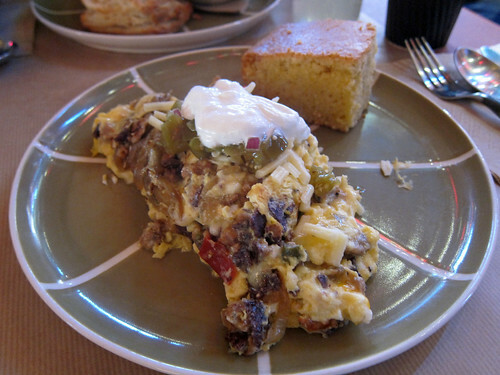 Service was generally good and the space itself was strangely homely… if your home had chopped straw covered walls. It’s well worth a visit if you’re craving something of that ilk in the area. This is said quite often on London food blogs but this time I’m sure it’s true: I think I must be the last food blogger to make it to Franco Manca. I’ve just not found my way to Brixton market to try their pizzas, made with their renowned slow-risen sourdough. Last weekend though, this famed pizzeria opened a second branch on Chiswick High Road, only a short bus ride away from us. We visited on Tuesday evening. 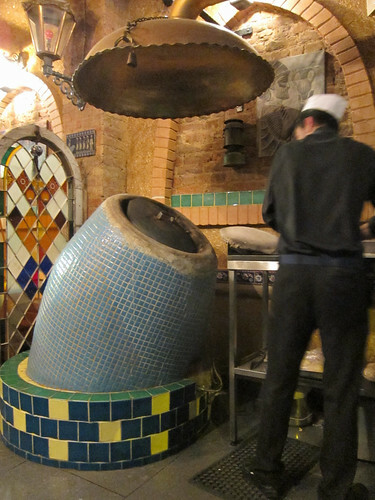 There was a mix of smaller tables with benches for four and larger communal tables – we sat at the end of one of these, right by the beautiful tiled wood burning oven. The tables were set with the menus as placemats and cutlery and napkins were all bunged into big tins in the centre. I already liked the casualness of the place; service was friendly and eager to please. What struck me were the prices – they’re significantly lower than most of the well-known pizza chains and also cheaper than Rossopomodoro. And most of their ingredients are organic, with a lot of the non-perishables brought over from Italy and the fresh ingredients sourced locally. How do they do it?! We started with a bottle of their organic homemade lemonade (£3.60 for a large bottle) and some filtered water (complimentary). Their lemonade was an odd colour – no lemonade I’d ever had was the colour of…orange squash. I think they must use golden caster sugar or some other more raw sugar for their lemonade to be this colour. It was refreshing and not too sweet but not lemony enough for us. To offset the carbs we’d be consuming, we’d ordered a small salad (£1.90) on the side. 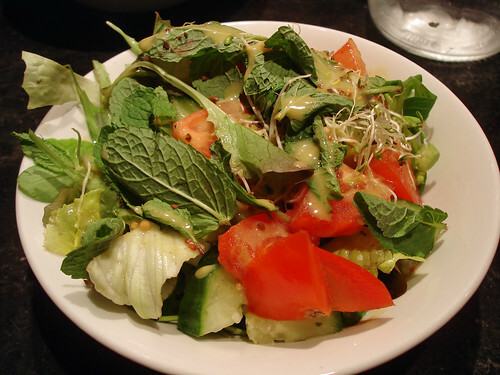 This arrived before our pizzas: lettuce, tomato, cucumber, mint, alfalfa sprouts all in a honey mustard dressing. This was actually quite pleasant and we made short work of the bowl. 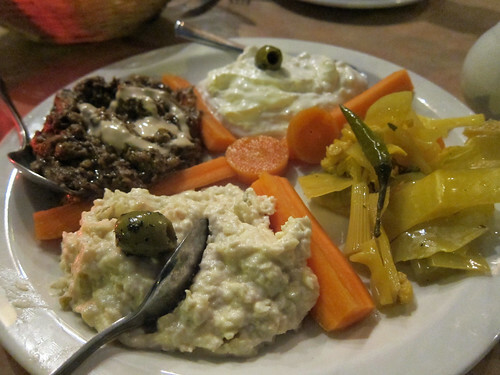 Their menu indicates that salads do change based on the seasons and market availability. 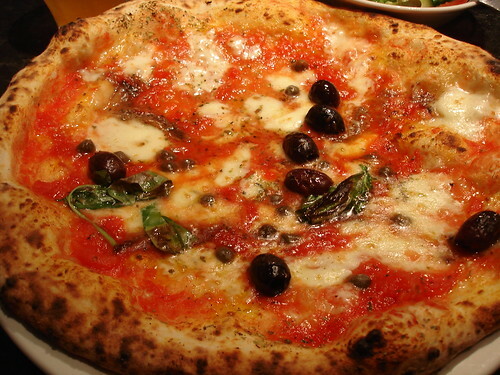 A number 4 for me: tomato, garlic, oregano, capers, olives, anchovies and mozzarella (£6.20). I started cutting a slice out and as my knife went through the crust, the surface started making little crispy, shattering sounds. Brilliant. The tomato sauce was very flavourful and all the toppings delicious and just salty enough. The centre of the pizza did go a little soggy due to the sauce and cheese but it was something I’ve encountered before – not sure how to overcome this while keeping the crust extra thin (How do the pizzerie in Napoli do it?). Bottles of very moreish garlic oil and chili oil were set on the tables and made for excellent crust dipping. 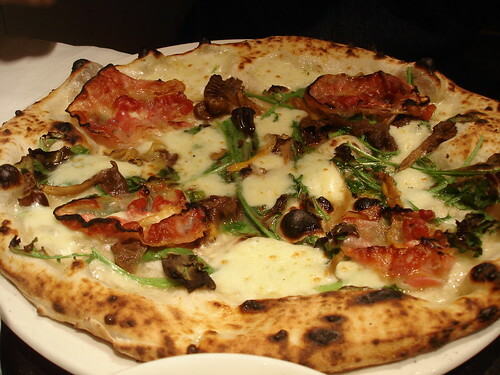 For Blai, the meat special of the day: pancetta, rocket, wild mushrooms, parmesan, mozzerella (£6.90). This was a tomato sauceless (aka white) pizza, which was actually fine with me this time. I felt like I didn’t miss the tomatoes at all – the toppings were all so rich and flavoursome. The pancetta was sliced so thinly and became crisp after baking while the wild mushrooms were all fresh (not tinned!). These pizzas were excellent and I think some of the best Neapolitan style ones we’ve found in London (and possibly the cheapest!). Two things would make this place even better: 1. Fritti like they do in many Italian pizzerie and 2. Dessert. But what they are doing, they’re doing very well so please don’t change that! 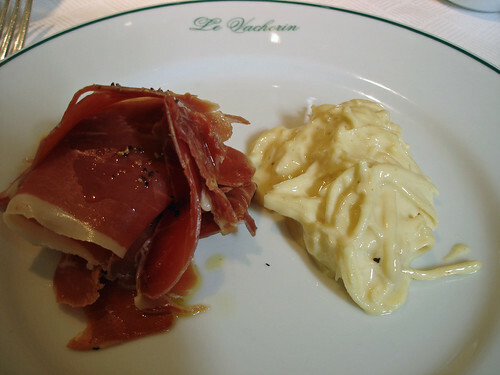 I’ve written about Le Vacherin before, when I visited for dinner, and it was only dinnertime that I’d visited until about a month ago, when we went for lunch. It was at Thring for Your Supper where I first learned of the bargain of a lunch he’d had there. On Sundays, when he went, it’s £19.50 for three courses; on all other days, it’s £16.50 for three courses and £14.50 for two. (I notice that the website has been updated this month to £19.95 and £16.95/£14.95, respectively). Luckily for me, Chiswick is but a gentle bike/bus ride away from home and we chose the former option that Saturday. I parked directly across from the restaurant so it could be watched at all times – I still freak out about bike thieves. Cue Blai – “No one wants to steal your bike.” Well, yes, perhaps my vintage folder isn’t exactly on the hot list but I love it so much. We were the first into the restaurant (I was hungry!) and we were seated in a prime spot by the window (good for my incessant looking out at my bike). 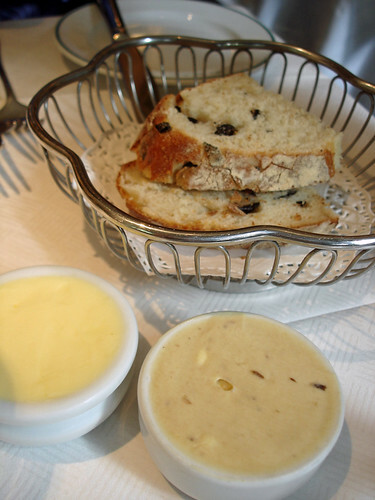 Bread and butter were brought out almost immediately – the butter being one of my favourites in London as one gets both plain and anchovy. 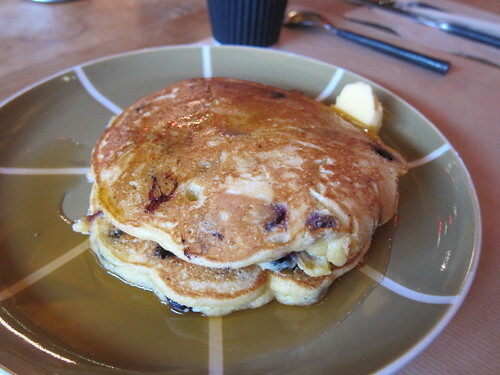 The butter should have been a little softer though – they were still fridge cold. From the lunch menu, I chose with the Bayonne ham with celeriac remoulade to start. It’s exactly what it says on the menu – a generous pile of thinly sliced Bayonne ham (similar to prosciutto) drizzled with olive oil and sprinkled with pepper alongside a slightly smaller pile of grated celeriac in a mayonnaise-based dressing. A bite of this, a bite of that – they balance each other nicely – the saltiness of the ham and the creaminess of the remoulade. 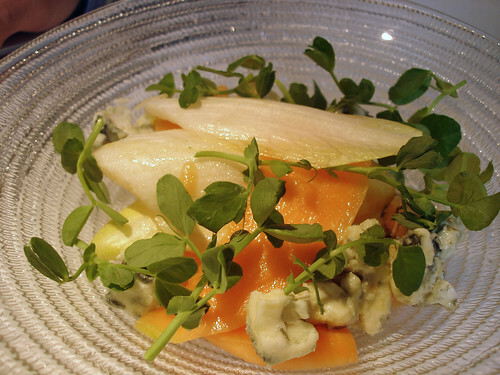 For Blai, the endive salad with Roquefort and melon – he adores blue cheese with endives and found that the addition of the sweet melon entirely complemented this classic duo. I wanted something fishy and light for my main course and so chose the sardines with roasted peppers. Two whole grilled, filleted sardines lay atop a mound of sweet roasted red pepper and fresh endive that was just starting to wilt under the heat of the fish. Nothing fancy but it hit the spot. 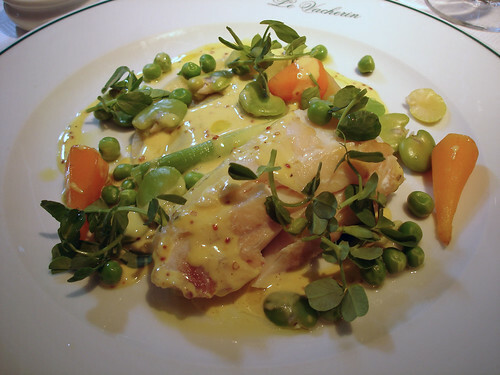 Blai also wanted something piscine and ordered the smoked haddock, mustard sauce. I can’t remember much about this dish other than he enjoyed it very much and cleaned his plate. It does look lovely! 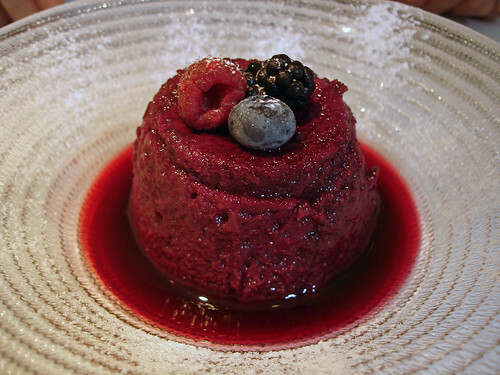 Summer Pudding is surely an unusual offering from a classically French restaurant! Blai’s dessert definitely looked like a prime example of this bread based, fruit stuffed sweet. 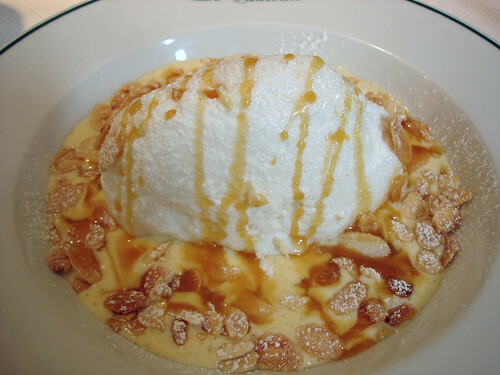 My Île Flottante was perfect. Seriously, this was the nicest one I’ve ever had and I nearly licked my bowl to prove it. The poached meringue was fluffy soft, the creme anglaise was beautifully vanilla-y, the caramel sauce not too sweet and the almond slices were caramelised and crunchy. Perfect. What a total bargain of a lunch this was! If the thought of getting to Chiswick makes your head ache, it looks like Le Cassoulet, Malcolm John’s second restaurant in Croydon, is equally as good. I was sad though to see that Le Vacherin was mostly empty for lunch that day – perhaps it was the middle of the summer hols. I shall return for more lunches in the future (especially since I hear their chicken liver parfait is gorgeous)!